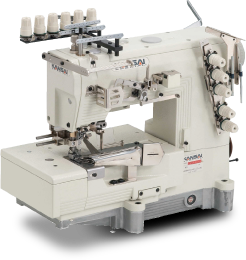 MMX series is a 3 needle coverstitch machine with smocking mechanism. 6 kinds of standard cams are available with purchase. The cams are easy to change without adjusting spreaders. The smocking threads fit on the fabric naturally due to the dual oscillating spreaders. Suitable for hemming and taping such as lady’s wear, children’s wear, underwear and so on.